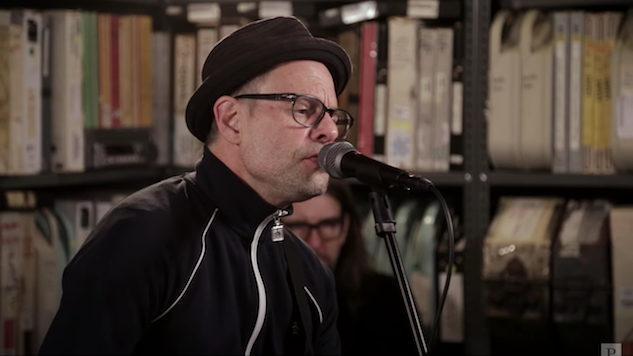 On Tuesday (Feb. 12), ‘90s hit-makers Gin Blossoms stopped by the Paste Studio in New York City on their day off from touring. On Monday night they played a sold-out show at The Bowery Ballroom and carved out time for a four-song set in our studio before heading to Boston for a night at the Paradise Club. During their session, they cracked open a few Pabst Blue Ribbons and played one song from their 1992 album, New Miserable Experience (fan favorite/radio hit “Hey Jealousy”), plus “Competition Smile” from 1996’s Congratulations I’m Sorry and “Face the Dark,” from last year’s Mixed Reality. But before calling it a day, they delivered a cover of Radiohead’s “Fake Plastic Trees,” from the rock band’s 1995 album The Bends, a track frontman Robin Wilson has had on heavy rotation the last few months. Wilson knows upwards of 300 songs on the acoustic guitar, and after playing this one around the campfire on a recent hiking trip, he decided to bring it on tour. “It’s just been fresh in my head, and I just threw it out there and the guys just shrugged and said, ‘Yeah, why not?’” Wilson said of the iconic tune.